Root vegetables are winter’s best kept secret. Packed with nutrients, natural sugars and starch, the lowly root is a healthy and flavorful substitute for the ubiquitous potato, and a superb way to get your vitamins and nutrients in the cold weather season. A good peel of skin reveals a rainbow of colors ranging from magenta to ochre to creamy white, sure to brighten any dreary winter day – and your holiday table. Feel free to mix and match roots, such as sweet potato, parsnip, rutabaga, carrot, celery root, and of course the dependable russet, to your taste and preference. 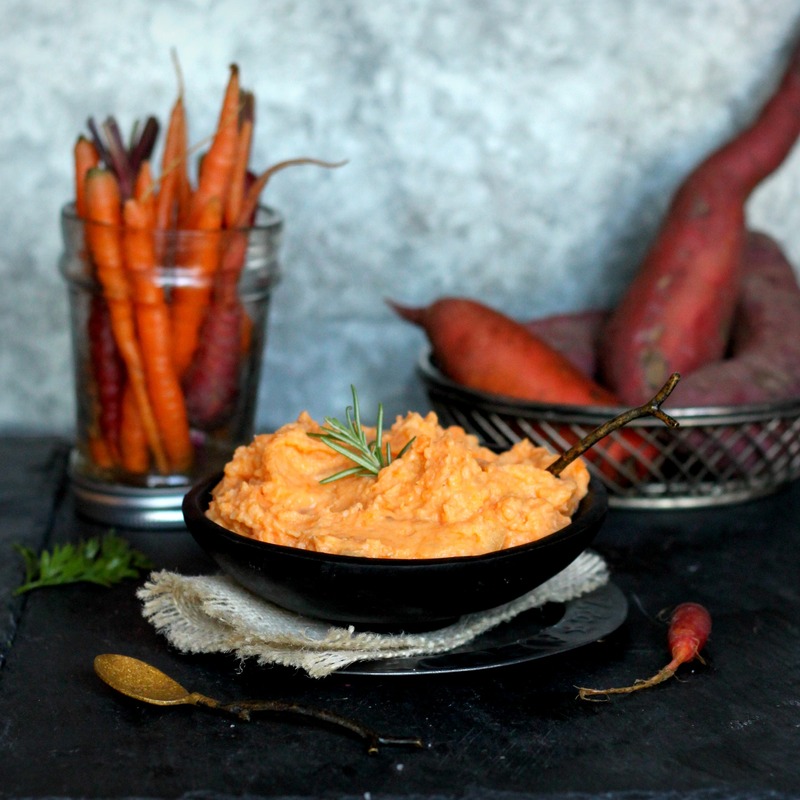 Choose a balance of sweet and savory roots for even flavor (I used 1 pound each of sweet potato, celery root and rutabaga) and mash to your desired consistency. I like to leave my roots a little chunky for a more rustic presentation. Peel the root vegetables and cut into 1-inch chunks. Place in a large pot and cover with cold water. Add 2 teaspoons salt. Bring to a boil over high heat, then reduce heat to medium and cook until vegetables are tender and easily pierced with a fork. Drain and return to the pot. Let cool 5 minutes. Add the garlic, butter, sour cream, and yogurt. Mash with a potato masher or in a food mill to desired consistency. Add salt and pepper to taste. Spoon into a serving bowl and serve warm. Prepare ahead: The mash may be prepared up to 1 day in advance of serving. Cool completely and transfer to a buttered, deep gratin dish. Cover and refrigerate for up to 24 hours. Remove from refrigerator 1 hour before serving. Preheat oven to 325°F. Dot the top of the mash with 1 tablespoon butter and cover with foil. Bake in oven until heated through, 35 to 45 minutes. A compelling case for omitting mashed potatoes from the Thanksgiving menu! Sweet parsnips would be a savoy addition to the sweet potato, celery root and rutabaga and one I can’t wait to try! Root veg are some of my favorites in the winter months. I love your combination of these three. Gorgeous color! I want to try this one. Might try some parsnips here too! A wonderful mash and combination! Your mash sounds great…I need to buy a rutabaga and try this. Looks so gorgeous.. lovely capture too !! LOVE this photo, and your mix of sour cream and yogurt in this awesome dish.